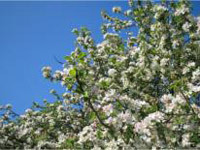 Beltane is the old name for May Day, the first day in May, and Beltane Eve is celebrated on April 30th. Another of the old Celtic Cross Quarter Festivals, Beltane is one of the few pagan festivals that has not been Christianised or altered to fit into modern society. 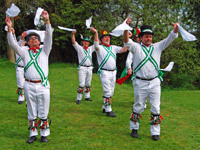 Today in many parts of the world, traditional May Day customs are still practised. Beltane comes from the Old Irish meaning ‘bright fire’, and in old times, fires would be lit and the cattle driven through them. This festival is the most joyous of them all, celebrating the incredible vitality of the earth at this time of year. The days are longer and warmer, the sap has risen and everything alive seems to be just bursting with energy and growth. Beltane is the first day of summer. 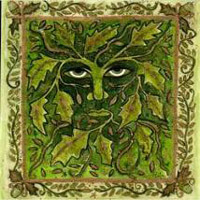 The symbol of Beltane is the ancient Green Man, to be found all over the country in the most unlikely of places. Many churches have green men hidden in ceiling bosses or peering down from dark corners. When Christianity superceded paganism in Europe, the image of the Green Man was impossible to eradicate as it represented such a powerful force – that of virility and growth. Other ancient customs from Beltane still survive, such as Maypole dancing, well-dressing and electing a May Queen. These customs are part of our folklore heritage, and have been revived in many parts of the country. Further information about the Green Man and also the May Day festivities that take place all over the country can be found here, at the Company of the Green Man website. Beltane at Stonewylde begins in the Stone Circle on Beltane Eve, when the spirit of the Green Man is invoked. He’s invited to preside over the festival and bring his fertility and virility to the proceedings. The huge standing stones have been painted to depict the foliate face of a green man, highlighted with gold. The great bonfire has been prepared, and the brazier installed on the May Sister. This is a special standing stone aligned to the May Day sunrise, and the Bel Fire is kept alight in the brazier all day, from sunrise to sunset on top of the stone. The Barn is decorated with boughs of hawthorn blossom and the children make papier mache masks of the Green Man, and cover them with real leaves. At Stonewylde Beltane is a very important festival because of its association with fecundity and potency. It’s on this day too that the Naming of the Babies ceremony takes place, when every baby born since the previous Beltane is paraded on the Village Green. Magus, dressed as the Green Man, and his chosen May Queen, present each baby with a charm to mark their birth festival. The best way to celebrate Beltane is to go alone into some quiet woods and sit silently under a tree, with your back against the trunk. 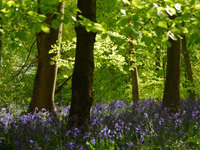 Feel the energy of the tree and listen to the sounds of the woodland all around. If you’re very still and very lucky, you may just get a glimpse of the elusive Green Man.